Creatures Features in Burbank, one of my favorite galleries, has invited me and a slew of other terrific artists to join in their brand new “Atomic Tiki Terrors” art show. It opens on July 19 and runs through August 9, 2015. It is a combination of two Mid Century American fads which are just as popular today as they were back then; Tiki Culture and The Monster Craze. Both were part of the fallout (pun intended) of the Cold War era. The possibility of Nuclear Annihilation drove Americans to drown their fears in fruity tropical drinks and lounge music, or to seek out Monster movies and television shows which provided scares, jumps, and the promise of escape from the all too real terror that surround them daily. For my Atomic/Tiki mashup, I went back to one of the favorite monsters of my youth. When I was just the right age, I saw a little black and white film called “War of the Colossal Beast”, which was the sequel to AIP’s “The Amazing Colossal Man”. The films tell the tale of Air Force Col. Glen Manning who bravely disobeys orders and tries to rescue some folks who crashed their light plane into the Nevada Test Site. Unfortunately for Glen, he is unable to reach the plane before the “Plutonium Bomb” they were testing detonates, showering him with radiation. Instead of killing him though, the extreme radiation causes Glen’s cells to grow rapidly, repairing his injuries, and causing him to grow to 60 feet tall. The rapid growth takes both his hair and his sanity. Eventually, the madness causes Glen to escape his military handlers and run rampant through the Las Vegas strip, causing untold toy car damage. He is finally herded to Boulder Dam where he is forced over the edge by a bazooka shot. He falls to his death, or DOES HE? In “War” we find out the fall didn’t kill Manning. It only ripped half his face off and caused severe brain damage. The gory exposed skull makeup, necessary because they had to use a different actor to play Manning, was paired with some impressive sound work. The Beast couldn’t speak. He could only growl and yell. With an appropriate amount of echo added, he is a giant after all, it made the Beast truly frightening for a young Monster Kid like me. The Monster was set. Now I had to figure out what to do with him. The Tiki-themed paintings I researched always depicted a lush, tranquil setting. Music was a key factor as well. 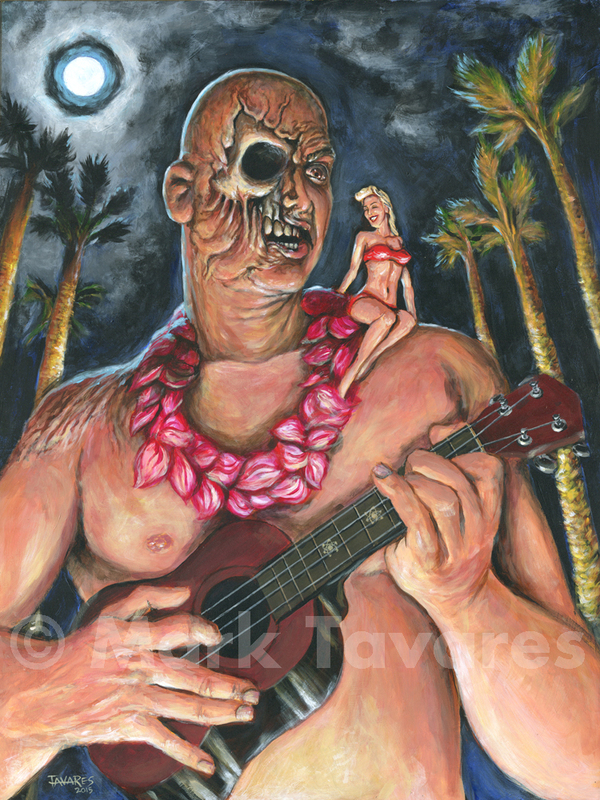 I thought the juxtaposition of a raging, howling mad Beast who could not speak, serenading a beautiful woman with giant Ukulele music would be a hoot. Trust me, when you see the film you will agree. So, here it is, “Colossal Lullaby” for your review. The show has a great collection of art on display. If you like “low” art and have a thing for the Monsters, this show is for you, baby! Thanks for looking! This entry was posted in Art for Sale, Gallery Showings, General Musings, Make-up Effects, Paintings for Sale and tagged acrylics, AIP, Art for Sale, Atomic Bomb, Cold War, Creature Features, Illustration, Inspiration, Low Budget, New Art, Painting, Portrait, Science Fiction, War of the Colossal Beast.